Augsburg - FC Bayern München didn't make too many excuses after suffering their first Bundesliga defeat in 53 matches away to enraptured FC Augsburg on Saturday. 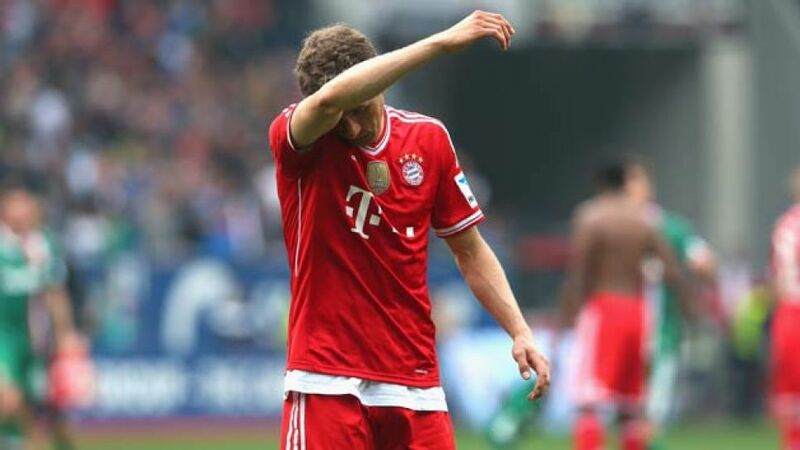 Thomas Müller: It hurts a little. We wanted to keep our run going, but we simply didn't show what we're capable of on the pitch. We knew before the game that it wouldn't be easy, but it wasn't part of our plan to go home with a defeat. Manuel Neuer: We took Augsburg seriously, but the most important thing for us today was to avoid picking up any injuries. That was the main thing because it's about the game against Manchester. Nothing else matters. Toni Kroos: We dominated the game, but lacked that cutting edge. We weren't patient enough to make the most of any clear-cut chances that fell our way. That was our shortcoming today, but it's not the end of the world. We want to win every game, and you could see today that in the second half we turned the screw and tried to find a goal. It just didn't happen. Halil Altintop: We put everything into it and got our reward. You saw that anything is possible for us on a good day. The team can be really proud, but after a couple of days we'll have to put it behind us and look ahead to the next game. Matthias Ostrzolek: We can be more than proud of ourselves. Even before the game there was a spine-tingling atmosphere and the fans really got behind us. We applied ourselves to the game and deservedly took the lead. You could see that as a team we're capable of playing at that level.